I am always on the lookout for great food products. 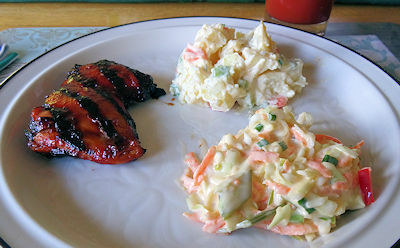 I have seen Rufus Teague barbecue products mentioned online and have heard good reviews. However, it was not available in local stores. Then, I saw some barbecue sauce while I was travelling and decided to give it a try. I chose the Whiskey Maple Sauce. In my opinion, there are two tests for barbecue sauce. First, brushing it on at the end of a cook. When used like this, a sauce has to stand on its own. There is little if any caramelizing of the sauce. It has to have a taste that complements the meat right from the bottle. The second test is when it is brushed on during a low and slow cook. This concentrates the flavours and the sugars are browned which changes the flavours. I decided to try the sauce first in a simple cook where the sauce is brushed on at the end of quick cook of chicken thighs. I started by putting a couple of tablespoons of sauce on 4 boneless skinless chicken thighs. I tossed them in the sauce and let them sit in the fridge for an hour. I fired my Weber Genesis grill up to medium high and put the thighs on. I cooked them for 3 to 4 minutes and then flipped them. I gave the cooked side a nice brushing of the barbecue sauce. I cooked for another 3 minutes and made sure the internal temperature was over 165 F. I actually prefer it about 170 F for thighs. I served the thighs with some coleslaw and potato salad. This sauce passed the first test with flying colours. I was suspicious of any commercial sauce that professes to be “maple” flavoured. It usually means a strong artificial maple flavour. This had a great sweetness with the touch of maple flavour you get from using the real thing. I got a background of maple without it slapping me in the face. The spice level was complex but actually quite mild. You enjoyed a touch of heat but even She Who Must Be Obeyed didn’t think it was over the top and she doesn’t like hot foods. The best thing about the sauce was the complexity. There were sweet, deep, spicy notes that changed as you ate them. Most commercial sauces try and give you lots of spice and heat. This had a great spice heat ration but also had a bold complex flavour. Mr. Teague, I salute you . You made a high quality sauce that I would be pleased to use as a finishing sauce or on my table for dipping. I am anxious to see how it does in the second test in a low and slow smoke. Oh My Word! I could just gnaw into that chicken like no tomorrow! I know. 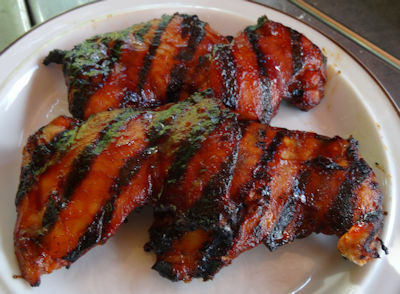 I love grilled chicken thighs and this sauce really goes well with them. Thanks for the kind words!